Do you have a friend that you never would have guessed you would hit it off with? Perhaps that person likes rock music while you prefer things that are a little big more country. Maybe you love to do arts and crafts, but your friend is more creative in the kitchen. That is the beauty of friendships, we often do not know who we will hit it off with and learn so much from others and their unique personalities. 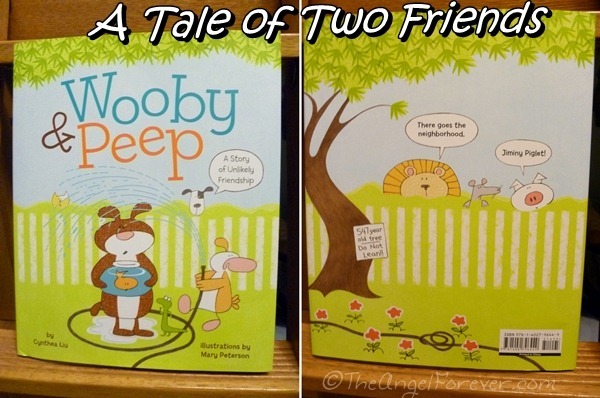 Enter the new book from Sterling Children’s Books called Wooby & Peep: A Story of Unlikely Friendship by Cynthea Liu (February 2013, ISBN: 9781402796449). When we received this book to consider it for review, my kindergartener immediately ran off with it. JSL was fascinated with the fun comic book style illustrations from Mary Peterson. He looked over the story alone and eventually came back to read it together. We start off meeting Wooby. He is living a happy life with his goldfish Wendy. He adores his quiet street, home, and yard. 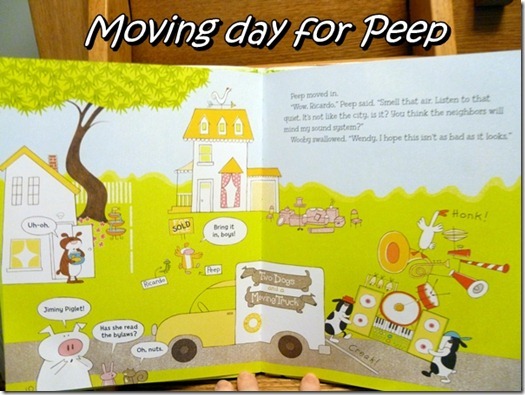 Of course, the house next to Wooby’s is for sale and the next thing we know, Peep is moving in and it causes quite the commotion in the neighborhood. 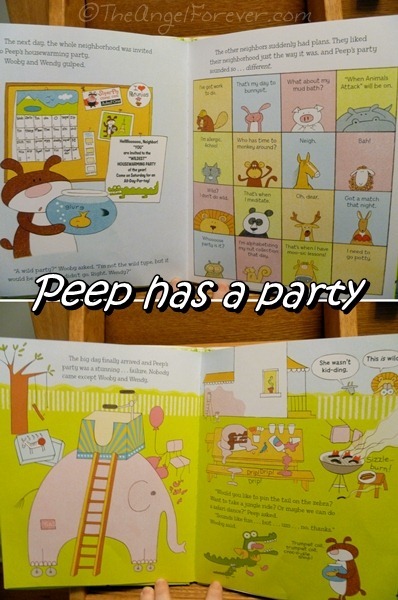 To get to know everyone, Peep decides to have a party and invites everyone to come. Unfortunately, they all appear to have other plans. 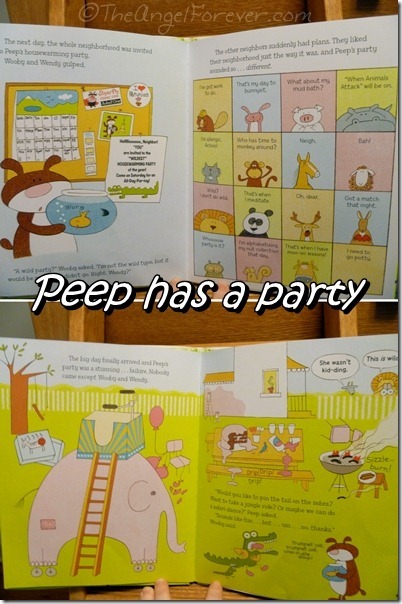 Peep’s party does not turn out very well. This is just the start of some tough times for Peep that we experience with him and Wooby. The pictures in the book make it seem like we are right there with the unlikely duo. 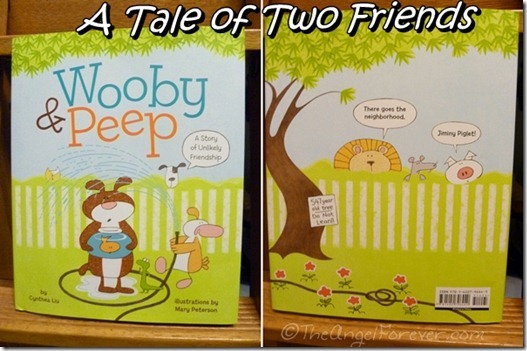 I am not going to ruin those parts of the story, but as you can tell from the title of the story, the two close neighbors become friends. This is a great book to read with younger and older children about patience with new peers, getting to know people, and trying to find things in common with others. As always, please share what you have read recently. Be sure to link up to your book posts in the comments below. Include something you read on your own, with a child, or someone else. Tuesday Tales are all about spreading the love for books. Disclosure: My family received the book mentioned above from Sterling Children’s Books in order to facilitate this review. No other compensation was given. The opinions expressed are my own. An Amazon Affiliate link is included in this post for the books mentioned. I will receive a percentage of money for the sale should you opt to buy the book through the link.